Monika Bhalotia comes to us all the way from India. Fascinated with fashion and flowers, she loves creating high fashion couture gowns and dresses using flowers from her very own garden. And although she doesn’t draw the illustrations herself, she loves bringing to life the beauty and new sense of depth that flowers give each simple drawing. On some runways we have seen a variety of food fashion, where various types of food is placed on a model to create a long daring ensemble good enough to eat. But very seldom do we see flower fashion of this kind. 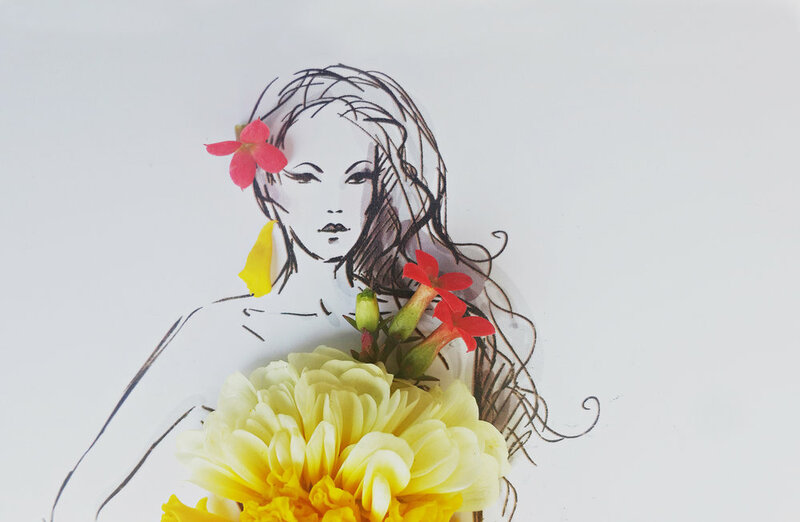 Combining the right flowers and colors can be challenging, but with her keen eye and knowledge of flowers as to what flower petal should be place on what part of each fashion illustration, Monika (aka Life Moshal) makes this talent uniquely interesting. This exotic multi-layered floral gown was created using; Marigolds, Carnations, Rozrazil, Kalanchoes and Chrysanthemum flower petals. The blouse was created using house plant leaf with crown flowers placed on top to add a delicate look.